The combination of intensifying cyclone events and ongoing and accelerating sea level rise is expected to have dire impacts on Tuvalu. The Tuvalu Coastal Adaptation Project assists Tuvalu by implementing measures that reduce exposure to coastal hazards in the three target islands, developing a long term coastal adaptation strategy, building capacity of national and local authorities to better implement adaptation actions, and investing in youth as future stewards of a resilient Tuvalu. 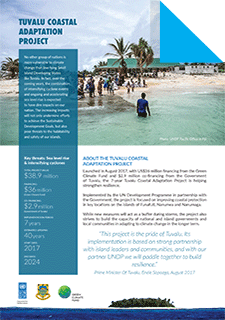 Financed with US$36 million from the Green Climate Fund and $2.9 million from the Government of Tuvalu, the project will enable the Government to take steps to manage the risks of coastal hazards. 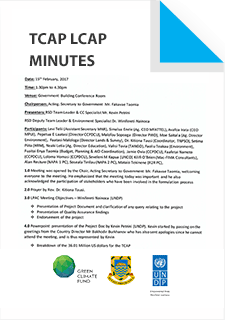 Strengthened technical capacity, knowledge and awareness of monitoring, protecting and maintening of coastal protection infrastructure. Enhanced long-term national human resource capacity and awareness related to coastal resilience. Coastal assessments undertaken in all islands in a participatory manner. Implementation of coastal protection measures in Funafuti, Nanumea and Nanumaga. All Islands Strategic Plans and annual budgets integrate island-specific climate risks through gender-sensitive, participatory processes. Strengthened capacity of Kaupules, Falekaupules and community members in monitoring coastal adaptation investments.